The auditors of Plus500′s UK accounts do not inspire confidence. In some of the discrepancies identified in Part 4, it is the Admission Document or the 2013 and 2014 Group accounts that appear to be overstated when compared the Plus500UK subsidiary filings. In others, statements in the Plus500UK subsidiary filings appear to be exaggerations relative to the company’s statements elsewhere. It is difficult to determine which filings, if any, are more reliable. While it is not generally the responsibility of auditors to proofread basic statements about the business by the company in a director’s report, one wonders if similar errors might be present elsewhere. For the year ended 2013, the audits of Plus500UK, Plus500AU, and Plus500 Ltd were performed by three separate, unaffiliated audit firms. For 2014, Plus500 has begun to take steps to clean up the audit structure by having PricewaterhouseCoopers affiliates in the UK and Cyprus perform the local audits. However, in 2013, Kesselman & Kesselman (PwC) in Israel would have had to rely on the work of Baker Tilly (formerly RSM Tenon) in the UK and Gauld Tulloch Bove in Australia. The 2010-2013 auditor of Plus500UK is a cause for concern. RSM Tenon nearly collapsed in 2012 after being discovered as having misrepresented its own accounts. After Baker Tilly bought the firm out of administration in 2013, the same RSM Tenon audit partner responsible for the 2012 report, Malcolm Pirouet, signed the 2013 report on behalf of Baker Tilly. Nor does the replacement of RSM Tenon/Baker Tilly with PwC necessarily improve the situation in the UK. After all, PwC was RSM Tenon’s auditor. Perhaps more importantly, just after completing the 2014 audit, Plus500UK hired Gareth Derbyshire from PwC to serve as head of compliance. Though not required, it is common for a company to change auditors after making a senior hire from its auditor. The new appointment creates the appearance of a potential auditor independence issue. Whatever the potential risks of the audit structure, the audit of the 2013 Group accounts was completed on 10 March 2014, which was at least after the Australia report on 7 March and the UK report on 3 March. In 2015, by contrast, Kesselman & Kesselman’s report on the 2014 Group accounts was dated 16 March 2015. However, Plus500CY’s audit report was not signed until 29 April 2015 and Plus500UK’s is dated 10 April 2015. What exactly was Kesselman & Kesselman auditing in March of this year? 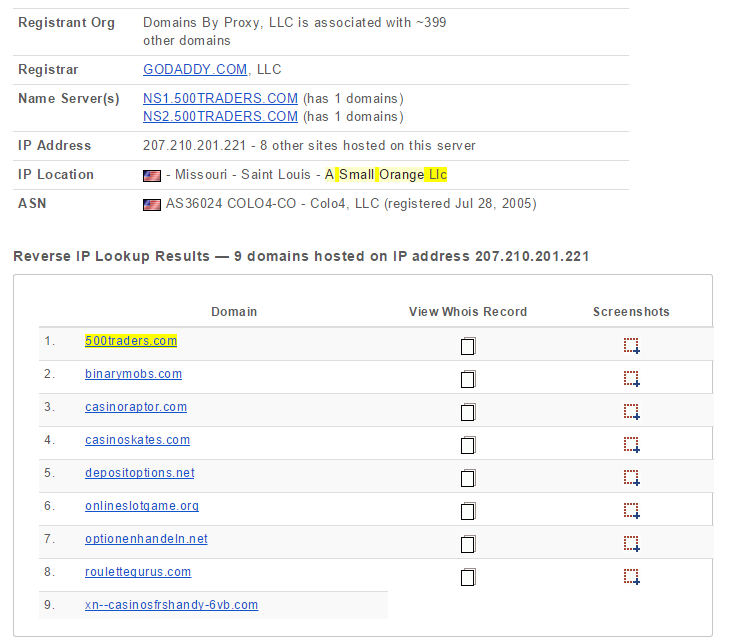 Were they relying on unaudited subsidiary results? In the context of a significant restatement of the UK subsidiary’s accounts, how could Kesselman & Kesselman complete its Group audit ahead of time? The 2014 Plus500UK accounts include significant inter-company payables (“Other amounts owed to group undertakings” at note 17) that would be eliminated upon consolidation in the Group accounts. 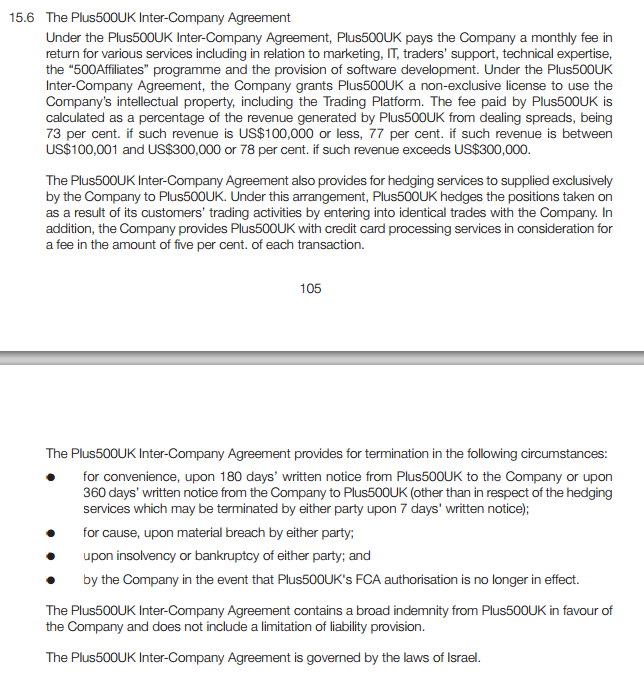 The revised revenue recognition policy at Plus500UK implies that amounts owed under the inter-company agreement are paid to the Parent immediately and therefore not even recognized in revenue at the subsidiary level. How, then, did the amount of inter-company payables balloon from GBP 1.6 million in 2012 to 8.8 million in 2013 and 12.4 million in 2014? Are the audited inter-company amounts reported by Plus500UK the same amounts the company reported to Kesselman & Kesselman for the Group audit? Plus500 makes inconsistent claims about the basic details of its business. It will be a bit tedious to run through them all, but it should give investors pause that even simple facts like the number of CFDs offered on the platform are not consistently represented. For comparison purposes, I reference Plus500′s published annual and interim reports, the company’s website, and the 17 July 2013 Admission Document (akin to an S-1). From its first version in September 2008 through today, the About Us page on Plus500′s website refers to ”strong execution relationships with many of the world’s largest international banks” and states that “Plus500 receives and is able to pass on the benefits of size, better prices, and better execution to our clients” even though Plus500 operates a bucket shop that does not transact for clients on an agency basis. In the 2010 director’s report dated 11 March 2011, Plus500UK referenced “almost 20,000 active customers since commencing business,” covering the period from 21 September 2009 to 31 December 2010. The Admission Document (p.17) put the number of active accounts in 2010 alone higher at 26,570. From March through September 2012, the About Us page inaccurately stated that Plus500 is owned by its UK subsdiary, Plus500UK Ltd, and implied that the company’s small office at 359 Goswell Road was located in the financial district (“the city of London“). More about the Plus500 ownership on the About Us page is in Part 7. The March 2012 About Us update also introduced the claims, still on the timeline today, that Plus500 has “over a million clients” and reached “more than 1,000,000 traders” in 2011. 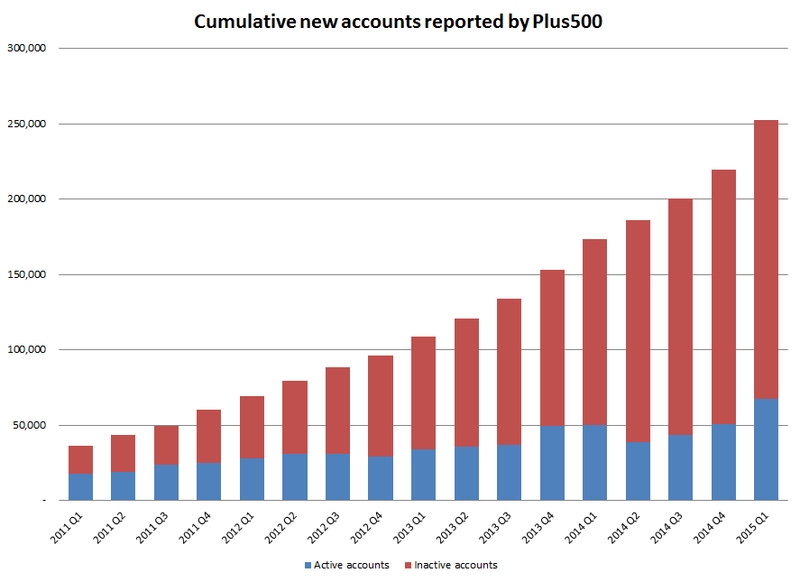 As shown in Part 3, the cumulative number of new accounts funded at Plus500 is only 252,748 to date. The timeline also includes the claim that Plus500 had more than 2,000,000 monthly transactions in 2011. In its 2012 action against Plus500 for failing to properly report transactions, the FSA counted only 1,332,000 total transactions over the period from 29 June 2010 to 5 November 2011. The monthly amount claimed, if annualized, is also more than double the 10 million trades for the following year claimed in the Admission Document (p.20). In the director’s report for 2011, Plus500 had “54 different countries in 34 languages.” In 2012, the figure was “55 different countries and 36 languages.” The Admission Document published 4 months later states on p.15 that “The Trading Platform has been localised into 30 languages.” Most subsequent documents reference 31 languages and “more than 50″ countries. The website currently shows a drop-down list with 32 languages to choose from. The 2012 director’s report dated 8 March 2013 states, “We currently have over 86,000 active customers globally.” The number of active customers in the full year 2012 was 58,343 as reported in the Admission Document (p.17). Curiously, 86,000 (85,795 to be exact) is the number of active customers the Company reported for 2013 in its Group filings one year later. The Admission Document states that 88.7% of 2012 revenues, or $49.8 million, were generated by customers domiciled in the EEA/Gibraltar. By law, these revenues should have been earned at the regulated UK subsidiary. However, the UK subsidiary reported revenue of only GBP 27.2 million (about $44.7 million) in its 2012 accounts. That leaves $5.1 million of revenue purportedly generated by customers in regulated jurisdictions that did not flow through the regulated subsidiary. The discrepancies in 2010 and 2011 are even larger, as discussed in more detail in Part 6. The 2013 director’s report dated 3 March 2014 contains several inaccuracies. The filing states, “During 2013 we broadened our offering with an additional 1,000 CFD products…We currently have just over 416,000 users globally accessing over 3,000 CFD products.” As noted above, there have been only 252,748 new accounts reported to date and there were only 173,437 as of Q1 2014. If Plus500 is including unfunded accounts, the 416,000 is still substantially less than the 1 million traders claimed on its website. The 3,000 CFD products referenced in the 2013 report does not correspond to other filings. The 2012 report one year earlier referenced 1,500 CFD products, for a total of 2,500 if Plus500 in fact added 1,000 during the year. The 2013 Group accounts published one week after the Companies House filing say that Plus500 offers 1,900 CFD products. The 2014 director’s report, in turn, says the company offers over 2,000 CFD products and added 400 during 2014, which would imply there were about 1,600 CFDs at year-end 2013. The Admission Document said that Plus500 offered 1,700 CFDs as of July 2013. On a Q3 2014 conference call, the Company stated that it offers 2,100 instruments, an increase of 300 from the end of 2013, with plans to add 200 more before year-end 2014. Neither figure corresponds to the number of CFD products reported in the 2013 and 2014 Group accounts. As discussed in Part 1, 2013 revenues are 80% lower in the 2014 Companies House filing than in the 2013 Companies House filing prepared by a different auditor. Neither the original filing nor the revised filing are consistent with the terms of the inter-company agreement in section 15.6 of the Admission Document (reproduced below for convenience). The 2013 and 2014 credit card charges (note 10) disclosed in the 2014 Companies House filing, when translated into US dollars, are $1.9 and $3.3 million. According to the inter-company agreement (below), Plus500UK pays the parent 5% of each credit card transaction, implying that credit cards were used to deposit about $38.5 and $67.0 million in 2013 and 2014. Although credit cards are the most convenient way to fund an account and are encouraged by the company, these amounts are significantly lower than than the $300 million+ the company’s investor relations representative estimated flowed through the company in 2013. The total processing fees paid by the parent (Group 2014 accounts note 11a) were $2.4 and $3.9 million. These figures are more consistent with the UK subsidiary representing 80-90% of the Group’s activities, not 17.5% as restated. Why is the 2013 restatement such a big deal? Most obviously, if the restated Plus500UK revenues cannot be accounted for elsewhere in the Group, the $115.1 million of revenues reported in 2013 is overstated by the difference of approximately $79.8 million and the Group financial statements cannot be relied upon. Alternatively, if the revenue discrepancy is due to additional trading activity outside of the regulated UK subsidiary, then Plus500 may have understated the degree of its unregulated activity in unlicensed jurisdictions. This would be problematic because the Cyprus license was not granted until 2014 and the Australian subsidiary reported only AUD 3.3 million of revenue in 2013, meaning as much as 80% of the company’s revenues would have been generated without a license. If the Plus500UK inter-company agreement remains in effect, the company’s explanation that Plus500UK revenues were simply reclassified from Plus500UK to the Parent is nonsensical. The agreement calls for 78% of dealing spread revenue to be paid to the Parent as compensation for the back-end and referral services they provide. If the missing revenues were in fact generated in the UK, they would have been paid over to the Parent anyway under the agreement. In the unlikely event the agreement were no longer in effect in 2013, the same year it was disclosed in the Admission Document, then the Company is extremely tardy in updating the market. In any case, the magnitude of the restatement (GBP 51.0 million, 80% of the 2013 revenue originally reported) is much more than the amounts that would have been payable under the inter-company agreement. Spreads were about 74% of revenues in 2013 according to a company presentation, so I estimate the inter-company agreement should have required Plus500UK to pay the parent approximately 74% x 63.8 million x 78% or about GBP 36.8 million based on the 63.8 million in revenue originally reported. Moreover, the 2014 Companies House filing includes costs to the subsidiary of GBP 3.3 and 5.0 million in 2013 and 2014 for “introductory commission” which “relates to platform provision and intermediation services provided by Plus500 Ltd.” (note 10). These amounts are significantly less than would be expected under the inter-company agreement. The restated Plus500UK revenue for 2013 was 12.8 million. Applying the same math as before, the 2013 payment should have been 74% x 12.8 million x 78% or about GBP 7.4 million. Based on the 2014 spread proportion of revenue of 87%, the expected payment for “introductory commission” under the agreement in 2014 should have been about GBP 27.1 million. The discrepancy suggests that spread revenue may be a lower proportion than claimed, as hypothesized in Part 2. According to PWC, the originally reported GBP 63.8 million of turnover included 18.7 million of improperly recognized cost of sales and e-money charges. The remaining 45.1 million in net revenue was further reduced by 32.3 million of “introductory commission,” which would appear to be amounts remitted to the Parent under the inter-company agreement. It is unclear why a portion of the “introductory commission” (the 3.3 million discussed above) would be reported as a separate cost item, or why amounts payable under the inter-company agreement would be recorded as a contra item to turnover. Like the 2014 subsidiary accounts, the Group accounts are also prepared under IFRS and do not include any cost of sales item. In other words, the $115.8 million of Group revenues in 2013 should be a net figure. Even assuming the introductory commissions were earned and paid to the Parent, that still leaves GBP 18.7 million (about $29.2 million) of revenue previously reported at the UK subsidiary unaccounted for at the Group level. If all this sounds complicated, it’s because it is. I have a few speculative theories to explain what’s going on behind the scenes, but these are questions the company should really clarify in its filings. If Plus500 has not fabricated revenues, I suspect the company may be generating substantially more of its profitability from either or both of 1) trades in unlicensed jurisdictions or 2) customer losses, than it has disclosed to the market. Additional trading in unlicensed jurisdictions would explain the large gap between net revenues at Plus500UK and net revenues at the Group level in periods where Plus500UK was the primary regulated entity. Note the “hedging services” provision in the inter-company agreement. Booking offsetting trades in the Plus500UK subsidiary would allow profits from customer losses to be disguised as inter-company transactions, while allowing the company to claim that customer positions represent a very small proportion of subsidiary revenues. If Plus500 continues as a going concern, it still deserves a low multiple. But there is a bull case. Customers run out of money. Using the 26,570 customers active in 2010 (Admission Document p.17) as a starting point, the cumulative number of new accounts reported has risen to 252,748 as of last report. However, the proportion of accounts active each quarter has steadily declined as customers depart. A small portion of previously active accounts have returned in times of significant market volatility, but to date the number of inactive customers, previously reported as new, has increased every single quarter. Indeed, in the Admission Document, Plus500 admits that customers have a finite lifetime. As of July 2013, “The Directors currently estimate that on average a customer remains an Active Customer for a period of 15 months and generates $1,700 in revenue for the Group” (p.23). Note that such a short customer lifetime is more characteristic of an online gambling operation than a reputable brokerage. The $1700 figure is consistent with 2013 reported ARPU of $1325 (15/12 x $1325 = $1656). The company’s investor relations representative now claims an average customer stays for 18 months, although the customer activity data suggest 15 months is closer to the right figure. Based on 2014 ARPU, an 18-month lifespan would imply a potential lifetime value of up to $3240. Among the 252,748 cumulative accounts to date, including 185,081 inactive in Q1, approximately 99,435 are less than 18 months old, and therefore might yet still have capital available to trade. From this, we can calculate a going concern valuation of the business. What is Plus500 worth as a going concern? Instead of capitalizing earnings at an arbitrary multiple, it makes more sense to think about the lifetime value of the current customer base, in order to back into what the market is paying for potential future customers. Taking the company at its word and assuming the remaining 99,435 potentially active customers have a weighted average remaining life of 10 months (computed on the number of new accounts reported in each of the last 5 quarters), they could each be expected to generate just under $1800 in additional revenue based on 2014 ARPU, for a total of $178.4 million. Assuming a 15-month lifespan, future revenue would drop to $124.7 million. This is one-time, non-recurring turnover that should not be capitalized. Future growth depends on attracting new customers to the platform. Using the company’s 2014 net margin of 44.8% (which fairly accounts for operating expenses and ongoing advertising and revenue sharing—not all user acquisition cost is upfront), this gives a range of $55.8-79.8 million in value that the current customer base can be expected to generate for Plus500. I won’t even bother discounting it. Added to stated cash balances of $88 million, the remaining value of Plus500′s ongoing operations is GBP 1.25-1.46 per share, plus the value extracted from any future customers acquired. In other words, even after this week’s decline and any reputational damage from the account freeze, the market is ascribing about $300 million in present value to Plus500′s future customer acquisition efforts, roughly an additional 200,000-250,000 new customers using the same approach as before. In my opinion, if regulators carefully review the reporting inconsistencies highlighted in Part 4, neither the monetization of the current customer base nor the acquisition of new customers should take place. Supporters of Plus500, in addition to making the obvious peer-group comparisons to CFD brokers with different, more sustainable business models, have very effectively countered a strawman short thesis. Zack Buckley of Buckley Capital Partners distributed a widely circulated long pitch on Plus500 last year that effectively sums up the bull case. In it, he expresses trust in the company’s management, while expressing skepticism that “a fraud” could pay dividends, be audited by PricewaterhouseCoopers (PwC), and have substantial insider ownership. I recommend reading the report and hope for Zack’s sake that he no longer holds a position in the company. I am not aware of anyone whose short thesis on Plus500 has been based on the assumption that the May 15 dividend was not actually paid, as suggested by the company. There is an important distinction between the type of outright financial statement misrepresentation common among some of the more egregious Chinese reverse merger scams in recent years, and other forms of major business fraud. Whether the financial statements fairly and accurately represent a company’s financial position and whether a business is truly everything it claims to be are very distinct questions. For example, a CFD brokerage designed to capture customer deposits as revenue will generate real and substantial cash flow, while perhaps representing itself as being more reputable and customer-friendly. Enron and Worldcom both paid regular dividends. The founders of Plus500 have cashed out to the tune of approximately GBP 164 million ($254 million) from dividends and share sales in the IPO and follow-on offering. Alon Gonen is already a very wealthy man. PwC is a reputable audit firm. In Part 5 I will discuss why there could still be issues with the financial statements.